This low-cost sensor uses capacitive coupling to measure absolute rotation. This sensor uses time-domain measurement based on capacitive coupling between parallel copper planes. Receive (RX) pads are tied to power and ground through large resistors. If a transmit (TX) pad nearby suddenly charges or discharges, we see a transient response on the RX pad before it settles back to its usual voltage. The scale of this transient depends on the resistor values, TX voltage change, and coupling magnitude. Since resistors and voltage swing are constant in this device, we can estimate the coupling by measuring the size of this transient response. The coupling is in turn based on the geometric relationship between the TX and RX plates, which allows us to find rotation. Similar devices with different geometries can be used to measure linear displacement. 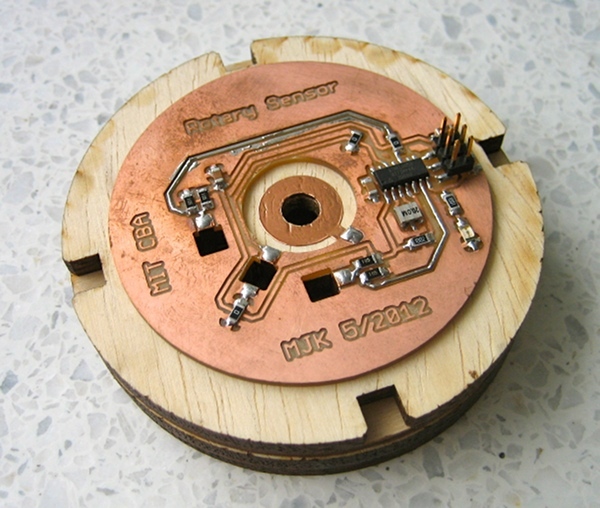 The sensor is assembled from laser-cut wood slices, copper tape, and a custom PCB. 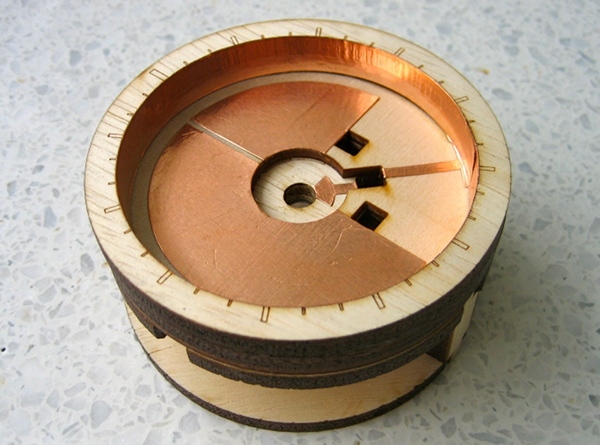 A copper panel on the bottom of the rotating circle charges and discharges, inducing a signal on a pair of receiving receiving pads. This signal is sampled and accumulated to detect absolute position. The interior contains two large copper pads. These are receive (RX) pads. 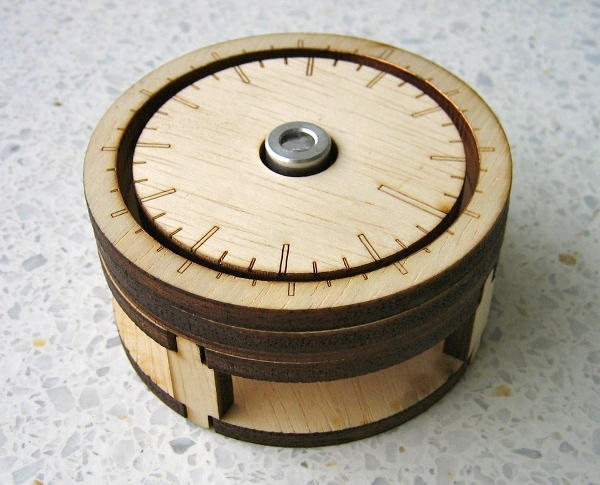 The larger one is used to measure rotation, but it can't distinguish clockwise from counterclockwise; the second smaller pad resolves this ambiguity. When fully assembled, a thrust bearing is used as a one-conductor slip ring. This carries the TX signal from the small central pad to the copper TX pad on the rotating disk. The TX, RX, and GND pads are routed through the body of the sensor and soldered onto the PCB, which is on the underside of the body.